So now I have quite good variety in my forces. 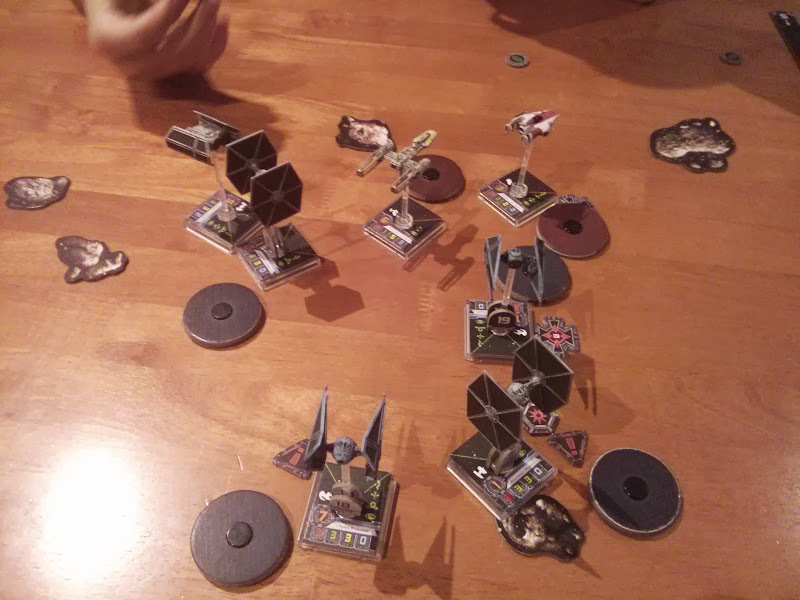 I can’t quite do a “spam” of TIE Fighters yet (they’re still as rare as hen’s teeth, and I can’t get my hands on any) but I can do a nice mix of Rebel fighters and, as my brother proved, drop a sizable fleet of mixed TIE’s for them to shoot at. So my brother and I had two battles. I played as rebels first, and imperials second. Neither went too well for me but it was nice to get so many mini’s out on the table. Rebels – yay! Empire – boo! 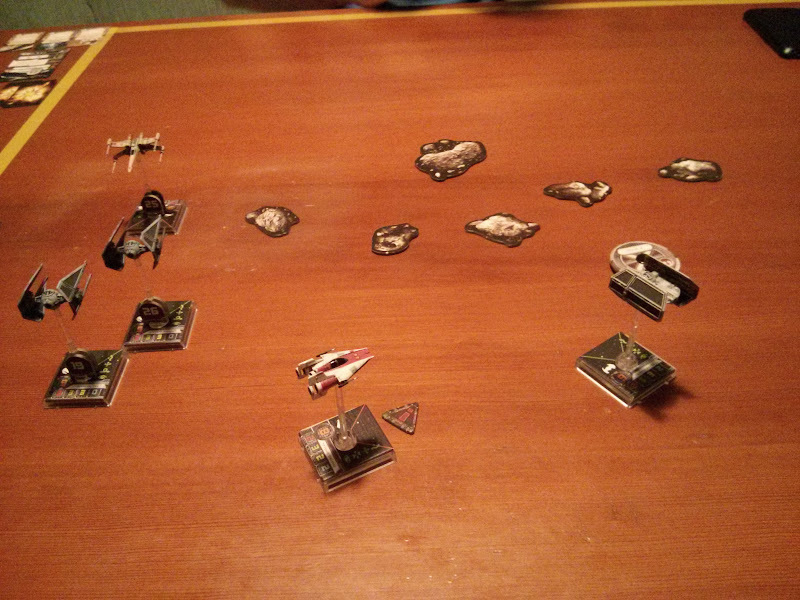 First up I went with a mix of Rebel ships and flew them in tight formation. My idea was to use the abilities of pilots like Biggs and Dutch that give allies within range 1-2 advantages. 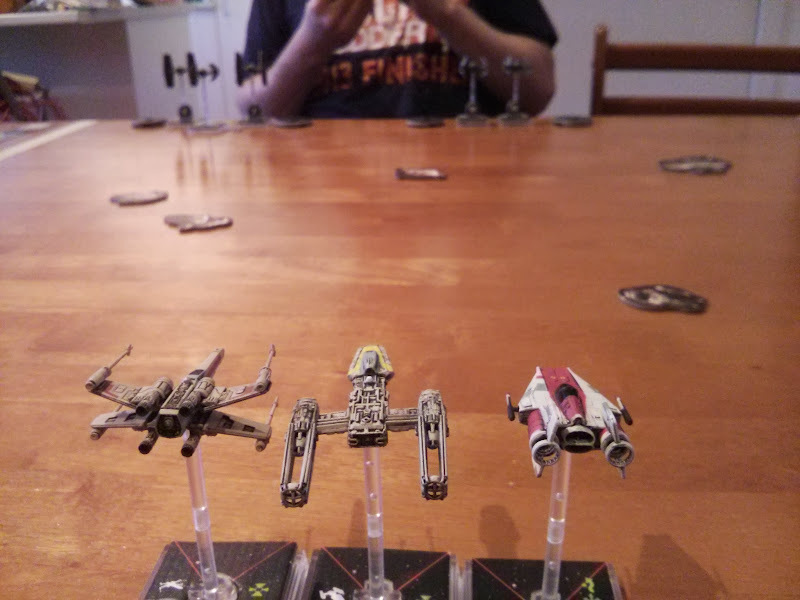 The biggest problem I found with doing this was the Y-Wing really slowed the A-Wing and X-Wing down… also the imps had WAY MORE GUNS! The extra skill of my pilots was largely off-set by “swarm” tactics that elevates pilot skill and Darth Vader’s ability to give low-ranking pilots an extra action… that was all on top of the fact that Soontir Fel and Darth Vader have better skill than most Rebel pilots anyway. So the only advantage I had was in my pilot’s special abilities, and they just don’t cut it against nearly 2:1 odds. The biggest problem my brother had was his own ships. This is why you should fly in formation, boys. 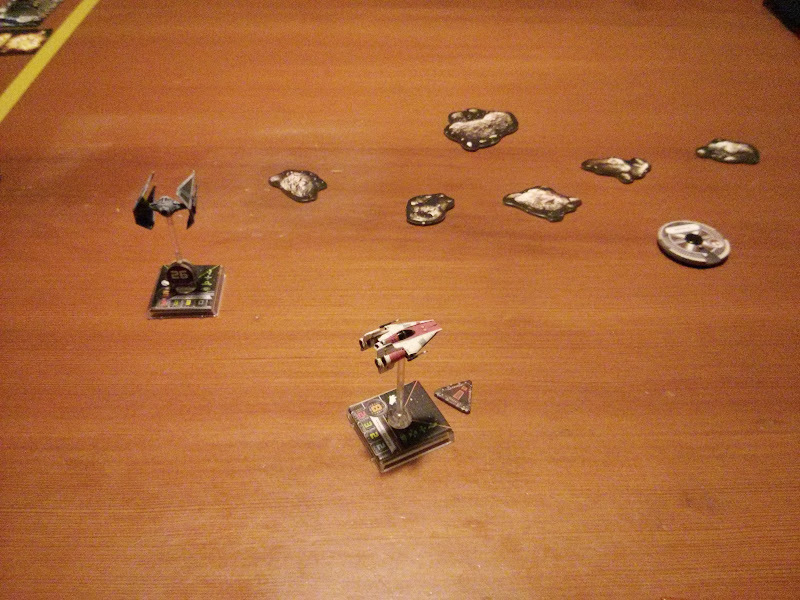 The A-Wing is pretty damn hard to hit, so it survived until the end, but we hardly made a dent in the TIEs. I tried to get them with an Assault missile – I had the perfect opportunity to damage every single ship in one shot, but the force was not with me. The next game I wanted to see how Darth and two TIEs would go. 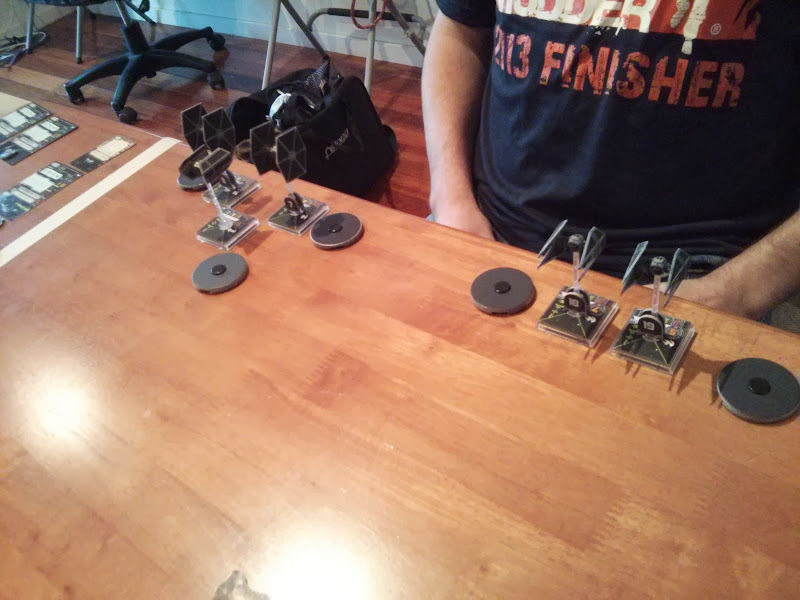 Wanting to have a fairly elite squad, I opted for two TIE Interceptors to assist Darth. I even gave Darth an engine upgrade so he could boost with the INTs and they could stay nicely in formation – hopefully for the whole battle. 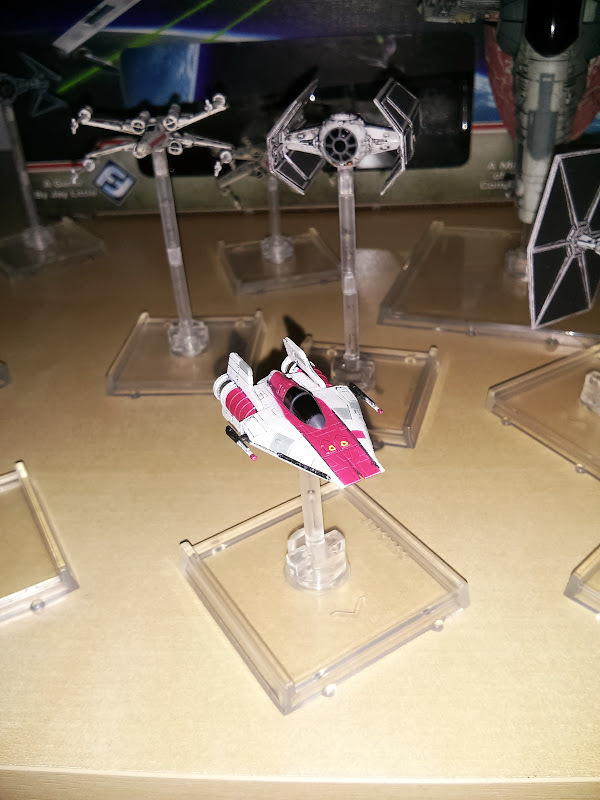 My Brother also had 3 ships – an A-Wing flanked by 2 X-Wings. There was a dramatic turn where 3 ships blew up. The below two images shows the before and after. So there I was. One on One. 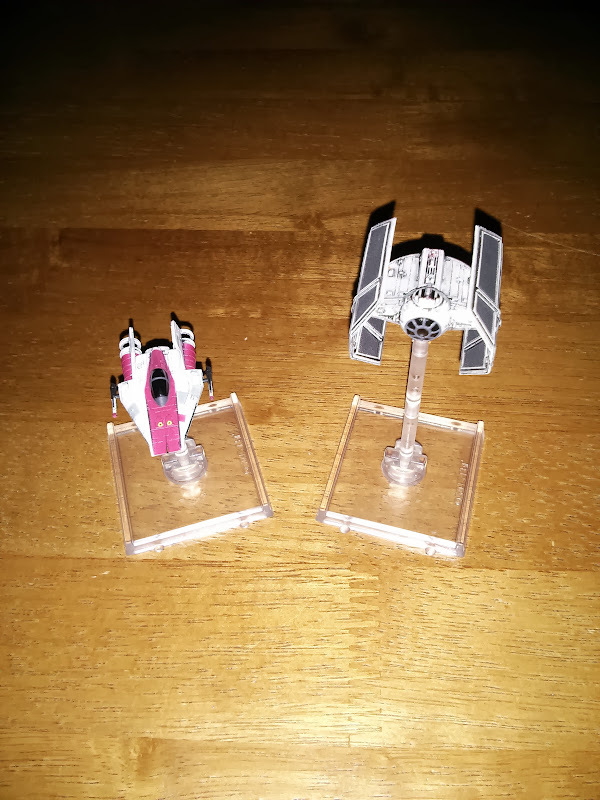 Interceptor vs A-Wing. They’re very similiar, the two ships, but my brother’s A-Wing had an unbeatable combination of higher pilot skill, and “Push the Limit.” This meant that no matter what maneuver’s we picked, he could correct by boosting twice to ensure that he was out of my arc, or get me into his. It was a little ridiculous actually. Truth is, though, if I hadn’t driven Darth into an asteroid for two turns, there is very little chance he could have avoided those two in combination. Oh well. Next time, I guess. ← Thought About Being a VR Dragon? You can’t pick the same action twice, even if you have them from different sources. So boosting twice isn’t allowed. Page 9 of the rule book, under ‘Other Actions’ (bottom of the left column). 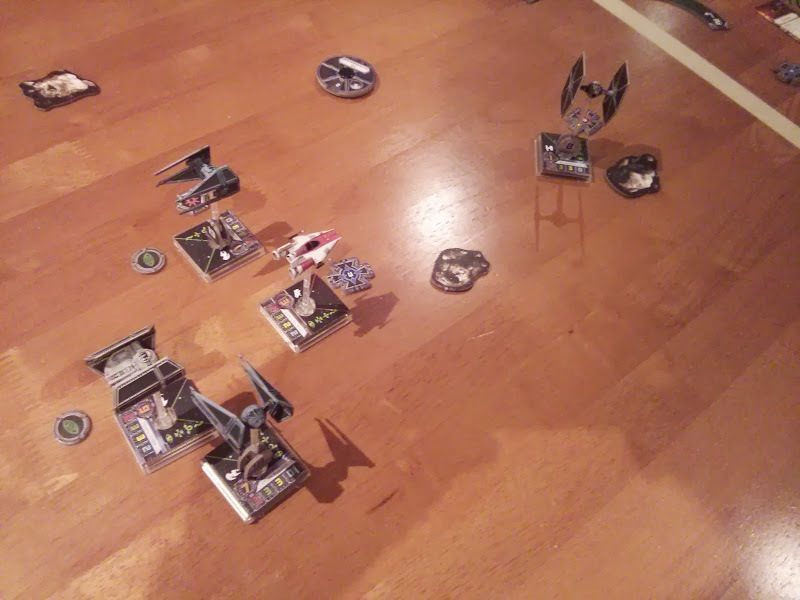 Thanks for this – I liked the A-Wing’s specific role, but push the limit and Tycho appeared to be a bit of a “must have” combination, which eliminates options. With this clarification, other builds are back on the table!